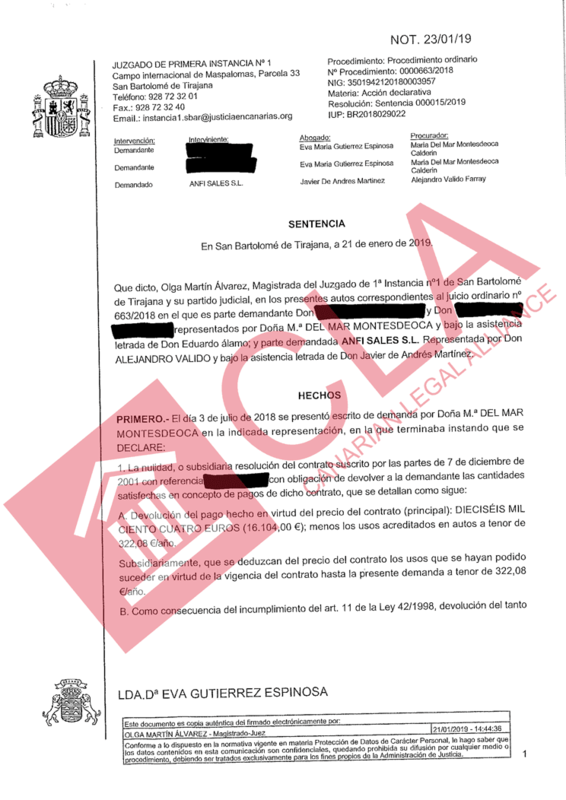 The judge not only declared the nullity of the contract with the repayment of the corresponding purchase price, but also ordered Anfi to pay back the illegally taken deposit payment in double, just as the Spanish Timeshare law sets it as sanction. CLA is proud to announce another won sentence against ANFI in which our clients contract has been declared null and void, and will get back more than 27,000€ plus legal interests and legal fees. This sentence is just one from the ELEVEN we have received this week, with a total claim amount of 340.000€ plus interests and legal fees. Anfi was the big looser in the past five days however we also received nullity of contracts from Silverpoint and Petchey Leasure. More details will shortly follow.